I don’t necessarily agree with all of this, but it still got a laugh out of me. Click to enlarge. 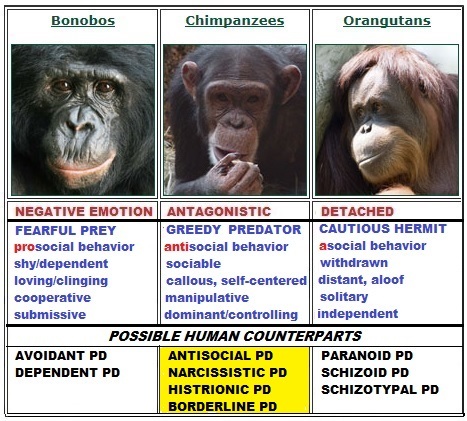 This entry was posted in apes, funny, humor, personality disorders and tagged bonobos, chimps, funny, humor, orangutans, personality disorders by luckyotter. Bookmark the permalink. Use the search term “a society where everyone is a sociopath.” This should lead you to the article where Chimpanzees are described – and, later in the article, the writer describes how the vast majority of people have the same ‘basic instincts’. The only thing that keeps most people from not doing ‘all predation, all the time’, is seeing others as sufficiently similar to themselves that they can think ‘if I do this, it will (sooner or later) happen to me in turn’. In short, it’s ultimately the (very real) threat of violence (social violence, legal violence, or in some few cases, physical violence) that keeps Normdom from not going ‘Full Pred’. I read that article. Yes, chimpanzess are generally psychopathic predators, showing little remorse or empathy. They’re all out for themselves. Yet they’ve survived pretty well. Bonobos, the gentle apes, hide from humans and are shy and solitary, and there are very few of them left and the ones left are highly endangered and protected. But they are also highly empathic and maternal, even the males, and spend lots of time grooming and taking care of each other. Orangutans are solitary also, but prefer to be alone and are not affectionate but not aggressive either. They are aloof and just want to be by themselves. I think they survive better than bonobos but are less endangered than chimps. Tells you something, doesn’t it?